Celebrate Valentine's Day Ballet-Style With These 8 Productions of "Romeo and Juliet"
Misty Copeland as Juliet with American Ballet Theatre. Photo by Gene Schiavone, Courtesy ABT. Valentine's Day makes February the perfect month for ballet companies to perform Romeo and Juliet, Shakespeare's famous tale of star-crossed lovers. A few companies presented their versions earlier this month and many are on their way in the next few weeks. 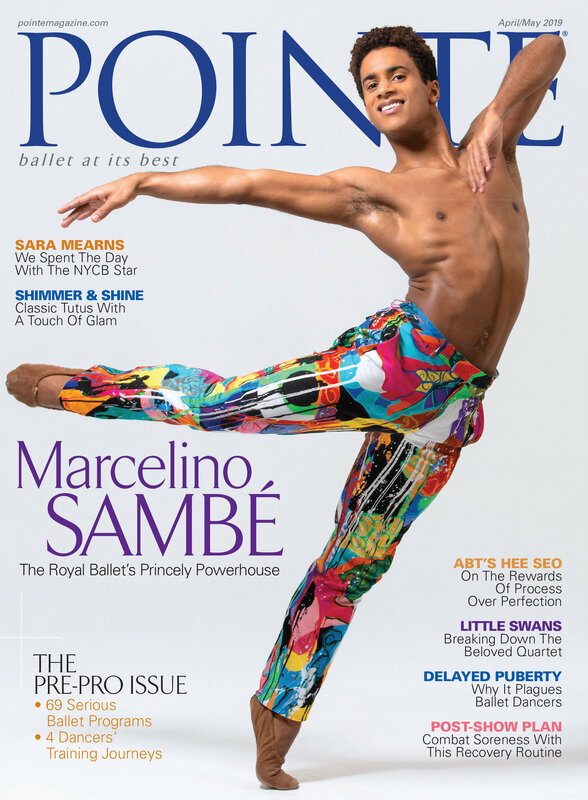 We rounded up eight companies including New York City Ballet, American Ballet Theatre, The Washington Ballet, Les Ballet des Monte Carlo, Orlando Ballet, Colorado Ballet, Carolina Ballet and Ballet BC to find out how they're using this classic ballet to celebrate the holiday of love. A 12-performance run of Peter Martins' Romeo + Juliet comes in the middle of New York City Ballet's winter season, spanning from February 13-23 at the Koch Theater in New York City. This year's production marks the debuts of corps dancers Harrison Coll and Peter Walker as Romeo, and former Pointe cover star Indiana Woodward will be making her debut as Juliet. Below, hear Tiler Peck, who will dance Juliet alongside Zachary Catazarro, point out the tricky technical moments in this role and explain what makes it so special to her. Vladislav Lantritov and Ekaterina Krysanova in "Taming of the Shrew." Photo by Alice Blangero, Courtesy Bolshoi Ballet. If you haven't checked your local movie listings yet for this weekend, hop to it. The Bolshoi Ballet in Cinema series and Fathom Events is broadcasting a performance of Jean-Christophe Maillot's The Taming of the Shrew to theaters nationwide on Sunday, November 19. (To see if it's playing near you and to purchase tickets, click here.) While the rest of the Bolshoi's cinema season features 19th- and 20th-century classics, The Taming of the Shrew gives audiences a chance to see the revered Moscow company in a thoroughly modern, 21st-century take on Shakespeare's famous play. Aside from a limited run in New York City this July, American audiences have had little exposure to Maillot's 2014 production. To learn more, check out these two exclusive, behind-the-scenes webisodes below. Principal dancer Ekaterina Krysanova, who stars as the hotheaded Katharina, gives an intimate play-by-play of two major scenes in Act I. The first is her fiery rejection of three potential suitors (who all would prefer to marry Katharina's younger sister Bianca). The Bolshoi Ballet in Cinema Series continues through June; for more details on upcoming screenings, click here. Marie Lindqvist as Juliet's nurse. Photo by Carl Thorborg, Courtesy Royal Swedish Ballet. In 2013, the Royal Swedish Ballet celebrated its 240th birthday. Never a company to be mired in tradition, RSB commissioned prolific and provocative contemporary choreographer Mats Ek to create a new version of Romeo and Juliet. True to form, Ek turned the ballet on its head, reversing the title, using new music and creating a world of simmering brutality. In recognition of his creativity, the ballet won the 2015 Olivier Award for Best New Dance Production. William Shakespeare's plays have provided inspiration to dozens of choreographers, but have you ever wondered how dance-makers translate his complex writing into beautiful dancing? This video from The Royal Ballet (a company full of natural dance-actors) provides an amazing illustration. Christopher Wheeldon's latest full-length ballet, The Winter's Tale, features Royal Ballet principal Edward Watson as the jealous and possessive King Leontes. In this video, actor Geoffrey Streatfield recites some of King Leontes' lines while Watson dances the scene they inspired. You can see how Leontes is teetering on the brink of madness—both in Streatfield's acting and Watson's movement. It's like a peek inside Wheeldon's creative process! Curious about how the rest of The Winter's Tale looks, translated into a ballet? The Royal has a ton of information on it's website about how the ballet was choreographed, designed and composed. Weiss rehearses dancers of Carolina Ballet. Photo Courtesy Carolina Ballet. To commemorate 400 years since Shakespeare's death, Carolina Ballet has performed three ballets this season dedicated to the Bard, crowned by the April 14 premiere of artistic director Robert Weiss' Macbeth. The ballet has costumes by David Heuvel and scenery designs by Jeff A.R. Jones, while J. Mark Scearce composed the commissioned score. It takes the work of a ballet dancer to embody the words of Shakespeare. With the help of Sergei Prokofiev’s masterful score, the Royal Ballet's Alessandra Ferri and Wayne Eagling approach this task with heartbreaking beauty. They perform the iconic balcony scene from Romeo and Juliet in this recording of the company’s 1984 production—and their movement speaks. Watch how the musical verse of Shakespeare’s words comes to life through Ferri and Eagling's bodies. The stage seems to float beneath their movements. They constantly rush from stage left to stage right, settling for only a moment in picturesque beauty. As they proceed from shy tenderness to overflowing passion, Ferri and Eagling transform into Shakespeare’s star-crossed lovers, making the audience’s heart sting with the knowledge of their fate. Happy #ThrowbackThursday!